So the ally that the summoner chooses for Summoner Support is usually the one they count on the most, right? You could put it that way. The summoner might lean toward an ally who sees a lot of action—their strongest ally or a Legendary Hero, for example. But what about us? We’re the ones who called Kiran to this world in the first place, aren’t we? Why weren’t WE chosen for Summoner Support? Ack! W-well…maybe it’s because we’re already doing such a great job that we don’t really need special support? Do you really think so? In that case, we’ll have to keep up the good work so that we can keep setting a good example! 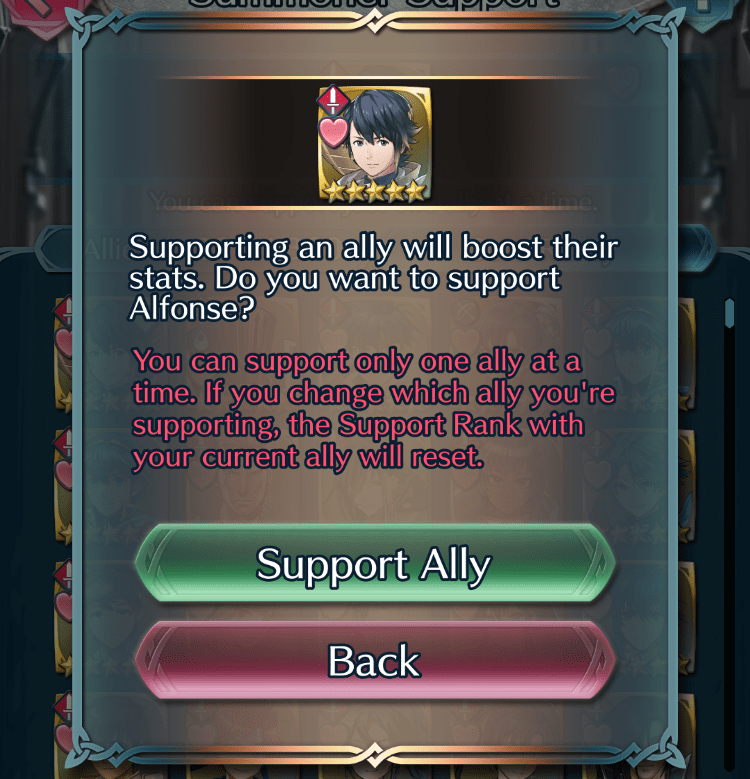 You can set up Summoner Support from the Interact with Allies menu to support one of your allies, creating a special bond between you and that Hero. You can choose only one ally to support at a time, and by having that ally defeat enemies of level 35 or higher, you can increase your Support Rank, which in turn will increase the stat boosts the ally receives. You can change the ally you’re supporting at any time, though doing so will reset your Support Rank. However, the rank you achieved will still be recorded in the Catalog of Heroes, so completionists can try to get Rank S with every Hero! Typically, you’ll want to choose to support your strongest allies who you often send into battle or colorless allies for their versatility. Legendary Heroes are some of the top candidates for Summoner Support, as you’re likely to use them very frequently in Blessed Gardens maps or the Arena. Of course, there’s nothing wrong with simply picking your favorite!